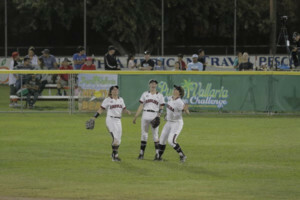 PUERTO VALLARTA, MEXICO — A walk and single in the top of the seventh proved to be the difference as No. 9 South Carolina softball produced a thrilling 7-4 comeback victory over Notre Dame on Saturday at Nancy Almarez Stadium. The Gamecocks entered the seventh trailing 4-3 but a Madison Owens walk and Kenzi Maguire single helped Carolina produce the needed runs to complete the win. In the top of the seventh, Jana Johns started the frame with a single to get some momentum rolling and the Gamecocks never looked back from there. Cayla Drotar’s single, a Kennedy Clark sacrifice bunt and Haley Simpson single to score a run and tie the game set up the eventual Maguire and Owens heroics. The Gamecocks moved to 29-10 in opening weekend games under Beverly Smith following Saturday’s game.